Anita Kerwin-Nye leads the Every Child Should Campaign and is a key note speaker at the CLOtC conference on 16 November 2017. I have written before on my own challenges with mental health and the import of the outdoors in my recovery. The evidence on outdoor activity for positive mental and physical well-being is significant and yet recent research suggests that children are not getting outside as often as we might hope. In a recent article in the Lancet quoting data from Public Health England we note that a number of children with clinically significant mental health issues might be as high as 10% – nearly 700 000 of our school population. The Lancet Report – by David Whitebread – outlines the evidence that suggests free play and the positive stress of outdoors play could make a contribution to the treatment and potential prevention of children’s mental illness. There are many experts working in this field working on this in their full-time roles – great organisations such as Mind and Place to Be and school system leaders such as Dr Kevin Rowland who is also speaking at the CLOTC conference. 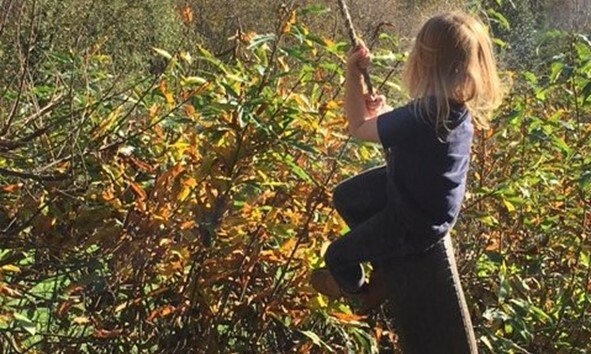 If every child should have access to both unstructured free outdoors play as well as to targeted interventions using the outdoors as resource for learning and well-being – how can we ensure that this is not just enrichment activity for the few but an entitlement for all? So – in my speech at the November CLOtC Conference I am going to draw on some examples of schools that are doing this well and consider how those of us with an interest in the restorative powers of the outdoors can work with schools to ensure access for all. With OFSTED calling for a broad and balanced curriculum; growing concerns about the pressures on young people; a new ‘Life Skills’ unit at the Department for Education; the recent announcement of funding for mental health first aiders in schools and a Green Paper on Mental Health in Schools due before the end of the year it seems like the time to refine and reconsider our offer to and with schools. How can those with the skills and expertise in outdoor learning work with schools to help them ensure that all children benefit from ‘ecotherapy’. An entitlement to the outdoors – for all not just the few. I look forward to discussing more with those who share this goal.